My Published Poetry Book owned by Celebs. My LIfe, Love, and Liberty in prose about my journey in the UK in realising and conquering my dreams of yesteryear making them a reality! Highly recommended and my published poems have been heard and seen on Radio and Nationall TV. 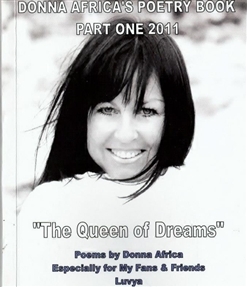 Inspirational and imaginative prose and a must buy for the Donna Africa fan out there!